There has been a torrent of words since last week’s UK Referendum vote to leave the EU. Changes upon changes to unstabilised political parties. Our newspapers and TV screens are filled with news of behind the scenes plotting, uncovering of mendacity, stabbings in the back, Machiavellian tactics, changing moment to moment - almost as if one had walked onto the set of a Shakespearean or Greek tragedy. Seven days since the result was announced - yes, only seven days. One of the most alarming, distressing, concerning aspects has been the rise, on the back of the ‘Leave’ result, of incidents of racism and xenophobia. The rhetoric of some of the campaigners, which demonised immigrants, seems to have legitimised previously held views and encouraged others to hold them. There has been a five-fold increase in reports of racial abuse, and this estimation is only of the incidents reported. It’s easy to blame others, having been told that they threaten one’s way of life and that floods of immigrants are responsible for one’s current woes. The ultra-right are having a field day. Let’s face it, we are all immigrants - my own genetic line, through my father, is from the earliest Scottish inhabitants, hunter-gatherers who spread northwards to the Scottish Highlands ten or eleven thousand years ago, as the massive ice caps of the last Ice Age retreated. They were following the herds. Palaeolithic ‘economic migrants’, as it were, attempting to survive and feed their offspring. Every one of us is part of a bloodline that stretches back some millions of years ago to Africa. Wherever we are now, our ancestors were originally from somewhere else. We are all immigrants, and we all live on the back of those who have travelled and endured great hardship for the continuation of our species. And we are all, somewhere far, far back, kin. I’m glad to say that, amongst the negative news reports there are also stories of the many people who are looking for ways to support and offer comfort to members of our community who are afraid. To put themselves in the place of others, to show compassions, to have the courage to speak up for, to stand up for those who cannot stand up for themselves. “From one point of view we can say that we have human bodies and are practicing the Buddha's teachings and are thus much better than insects. But we can also say that insects are innocent and free from guile, where as we often lie and misrepresent ourselves in devious ways in order to achieve our ends or better ourselves. From this perspective, we are much worse than insects. When the days become longer and there is more sunshine, the grass becomes fresh and, consequently, we feel very happy. On the other hand, in autumn, one leaf falls down and another leaf falls down. The beautiful plants become as if dead and we do not feel very happy. Why? I think it is because deep down our human nature likes construction, and does not like destruction. Naturally, every action which is destructive is against human nature. Constructiveness is the human way. Therefore, I think that in terms of basic human feeling, violence is not good. Non-violence is the only way. The Dalai Lama reflects on praise and blame in his commentary on lines from Longchen Rabjam's Finding Comfort and Ease in Meditation on the Great Perfection. dreams and have no true existence. THIS VERSE REFERS to the Eight Worldly Concerns: wanting to be praised and not wanting to be criticized, wanting happiness and not wanting suffering, wanting gain and not wanting loss, and wanting fame and approval and not wanting rejection and disgrace. We all experience these, don't we? Bowel movements apart, this final fixture of 2014 had been clogged with problems. The Nobel summit is held in a different city every year, and, for months, preparations had been under way to stage it in Cape Town, marking the first death anniversary of the most feted of all the laureates, Nelson Mandela. The Dalai Lama, with his vast global popularity, would be the star turn – but, as the date approached, it emerged that the South African government of Jacob Zuma would not grant the Tibetan a visa. Should the show go on without him? Supporters of the exiled lama said no: how could an event intended to celebrate the courage of the Nobel peace laureates fall into line with the cowardly action of a government being squeezed by China? Archbishop Desmond Tutu, the Dalai Lama’s old friend and himself a laureate, fumed, “I am ashamed to call this lickspittle bunch my government”. A new political party in the Tibetan diaspora, the Tibetan National Congress, took up the cause. “They swamped laureates with mails demanding the event’s cancellation,” said Dave Steward, executive director of South Africa’s FW de Klerk Foundation. Nine laureates and 11 affiliated organisations announced they were pulling out, forcing South Africa to concede defeat. At the 11th hour, however, Rome offered to host it instead. 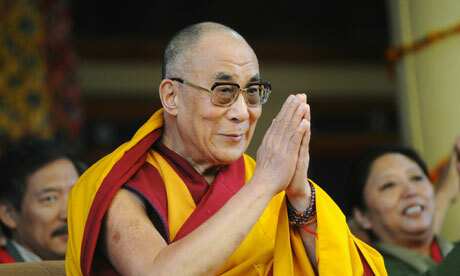 The reality television program MasterChef Australia made news when the Dalai Lama agreed to appear as a guest judge. But while His Holiness clearly enjoyed some of the dishes – particularly the yummy Sri Lankan vegetarian curry – he refused to render judgments: "As a Buddhist monk it is not right to prefer this food or that food," he said. Why not judge the food? Maybe His Holiness didn't want to hurt anyone's feelings. It is also an ancient rule for Buddhist nuns and monks to eat whatever food they are given as alms, without judging whether it is tasty or not. And that takes us to the issue of likes and dislikes. You may have heard the Buddha taught that life is suffering, and suffering is caused by desire. Updated to modern terms, what the Buddha taught is that we're all twitching masses of greed, insecurity and social programming. We hurtle through our lives grasping at whatever we think will soothe our existential angst while batting away whatever hurts us or pushes our ego buttons. And as we do this we cause a lot of trouble for ourselves and for those around us. There is a 6th-century Chinese text of the Chan (Zen) school that says: "To set up what you like against what you dislike is the disease of the mind." Very simply, sorting all phenomena into "like" or "dislike" bins gets in the way of enlightenment. What's the Dalai Lama's secret? He's got over two million Twitter followers, people buy his books in droves, his speeches sell out stadiums. In a highly cynical age, he's held the public's attention for over two decades with some pretty elementary ideas: the essence of human nature is to be happy, human beings are happiest when they help others attain happiness, all major religions nurture the most basic ingredient of happiness, namely compassion, but you don't have to be religious to be compassionate, you just have to live up to the basic goodness of your human nature. Like Socrates saying "I know that I know nothing", it's not just the simplicity of the message that attracts people, it's the remarkable journey of the man who is articulating it. The story of his escape from Tibet into India, his successful establishment of a government in exile, his continual advocacy for peaceful negotiations with his Chinese occupiers even while the culture and lives of his people are crushed day after day -- these things are well known, and more than enough to command admiration and attention. But what is astounding about the Dalai Lama is how much more he is than the spiritual, symbolic and political (although he's stepping down from that role) leader of the Tibetan people. For those of us who believe religion is a source of inspiration and a bridge of cooperation, at a time when people presenting religion as a bomb of destruction are ruling the airwaves, the Dalai Lama is our single most powerful example. It is this part of his mission -- Dalai Lama as interfaith leader, which is also the subject of his most recent book, "Towards a True Kinship of Faiths: How the World's Religions Can Come Together" -- that has brought him to Chicago for a set of presentations sponsored by the Theosophical Society. When a problem first arises, try to remain humble, maintain a sincere attitude, and be concerned that the outcome is fair. Of course, others may try to take advantage of you, and if your remaining detached only encourages unjust aggression, adopt a strong stand. And if it is necessary to express your views and take strong countermeasures, do so with out anger or ill intent. To countless Tibetans, His Holiness the Dalai Lama is a spiritual leader and a head of state in absentia. But to people around the world, Tenzin Gyatso is not only the greatest and most public advocate for Tibetan rights and the virtues of Tibetan Buddhism, but for interfaith tolerance and peace as well. For decades — and from exile since 1959 — he has worked to resolve tensions between Tibet and the People's Republic of China. And like Gandhi and Martin Luther King, Jr. before him, the Dalai Lama done so in a manner defined by nonviolence and tolerance. In 1989, he was awarded a Nobel Peace Prize for his efforts. The Dalai Lama's humility has endeared him to presidents and religious leaders of several countries, affording him the opportunity to raise awareness and drum up support for Tibet on a global scale. People often expect the other person to respond first in a positive way, instead of taking the initiative to create that possibility. I feel that's wrong; it can act as a barrier that just promotes a feeling of isolation from others. To overcome feelings of isolation and loneliness, your underlying attitude makes a tremendous difference - approaching others with the thought of compassion in your mind is the best way. From Tricycle: Since 1987 the Dalai Lama has met biennially with small groups of Western scientists to talk about the nature of mind and reality, and to plan collaborative research between science and Buddhism. These sessions, organized by the Mind and Life Institute, are designed to explore not only what Buddhism and modern science can learn from each other but also what they can learn by working together. Studies sponsored by Mind and Life are beginning to unravel the brain mechanisms underlying contemplative practice, providing scientific validation of the beneficial effects of meditation practice.